ONE TO FIVE WORKING DAYS: The majority (about 94%) of our custom pro-shop orders are processed, built, inspected and shipped in 2-4 working days. In the slower months (Jan-July) we usually beat that average by a day. In the busier months (August-December) we tend to run an extra day. So all things considered, an official 1-5 day lead time is the most honest estimate we can offer. We know our customers are anxious to get their hands on the goods and get started, so we keep our heads down and get our orders out as quickly as we possibly can. Nevertheless, we sometimes run into a snag (an occasional backorder, inclement weather, equipment failure, zombie attacks, etc.). If we do, we'll let you know. Otherwise, it's safe to assume your custom pro-shop order will be on its way in a few working days. Our customer service email system will keep you alerted to your order status along the way. That's the short answer. SERVICE WORK IS OUR BUSINESS: We don't sell bows like most internet and mail-order archery suppliers. 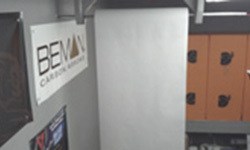 We service virtually everything we sell before it leaves our facility. Less than 1% of the bows we sell are "bare bows" in a sealed box. We think that's a lazy and irresponsible way to sell this kind of equipment. Our pro-shop sets up over 4,000 custom compound bow packages and over 10,000 sets of custom arrows each year, and every single bow and custom arrow set we prepare - from the cheapest to most expensive - gets our very best service and support. You won't ever catch us acting like a "big-box" store. We're not a distribution center, a mass-merchant, a warehouse operation, or some kind of "Power Seller." 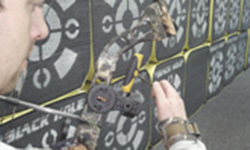 We're simply an eager Archery Pro-Shop, and we try very hard to do things right the first time. Of course, we make every effort to be fast too, but doing good quality work comes first. 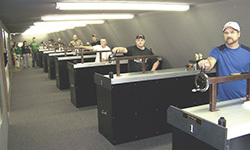 BUILT TO ORDER, NEVER PRE-FAB: Our pro-shop builds a bow system FOR YOU - to your specifications, sizes, and preferences. We don't make any assemblies ahead of time. As you will see, our process involves many steps and it cannot be done haphazardly if we expect to get good results. We've outfitted tens of thousands of new bowhunters over the years, and we'll take the time to make sure YOUR rig is done right. Once you've made your picks - it's time for us to get to work. We begin with the bare-bow, adjusting your bow to the precise draw weight and draw length you select. 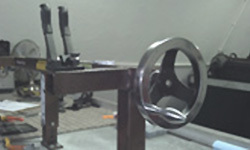 We check every bow for proper cam timing/synchronization and correct the common factory oversights (cam lean, sloppy axle spacers, untidy servings, etc.). We then professionally install all of your accessories, string inclusions, and additional devices. Our shop is equipped with modern finger-style bow presses to handle today's parallel and beyond parallel style bows. We only use calibrated digital weight scales and we spec every draw length by the official AMO method. We don't just guess or "go by" what's on the factory limb sticker. WE ACTUALLY MEASURE AND VERIFY EVERY SETTING. CUSTOM ARROWS AND BASE ARROW FLIGHT: Every bow package comes with arrows, but we don't use off-the-shelf machine fletch arrows ... EVER. Frankly, they aren't good enough. Instead, we hand build custom arrows specifically to work with your particular bow - matching the arrow spine, weight, length, and FOC to the output characteristics of your bow. Once the arrows are complete and our initial parts assembly process is finished, the bow is pre-cycled for string stretch and then moved into our tuning room where we conduct our basic paper-tuning processes to examine rest alignment and base arrow flight. 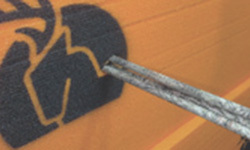 If a bow system cannot achieve a clean "bullet-hole" tear, it isn't ready to move on. We don't stop until we get it. In fact, we literally clip-out and send every customer the actual bullet-hole paper proof from our tuning room - we're that serious about our tuning process. But believe it or not, paper tuning is just the beginning. Paper tuning only gets us started. With the bow now in relative tune, we then range-test (group-tune) every bow system for accuracy at distance - making minor adjustments as necessary until every arrow is flying laser-beam true. We test-shoot every new system, literally dozens of times, until we're satisfied that the bow is grouping arrows well and performing properly. This also gives us an opportunity to debug noise problems, peep alignment issues, resolve minor fletching contact and fix all the other little annoyances that drive archers crazy. 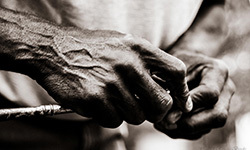 We take care of them for you. We don't believe in the "good enough" model. We keep working until it's right, so you can spend your time enjoying the sport instead of tinkering with your equipment. PRE-SIGHTING AND SPEC'ING THE SYSTEM: Once the bow is grouping properly downrange, our staff shooters set your top sight-pin for a 20 yard shot (by hand). Of course, every shooter is a little different. What's dead-on for one person might be a little off for another - so your fine pin-settings will be up to you (clear how-to instructions included). But our process puts you comfortably "on the paper," so you don't have to start sighting-in from scratch. Many of our customers never move their sight pins from where we initially set them, and almost everyone else reports their first shots within a few inches of the bullseye. Either way, you can comfortably expect your first shots to be on the target. When performance testing is complete, we weigh and spec the custom arrows, chronograph the actual arrow velocities for the system, compute the verified KE output; and we document the bow system's settings, final specifications, and serial numbers. 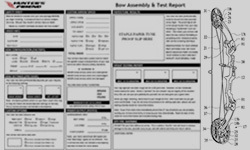 You will receive a copy of this Shop Order Assembly & Test Report - literally your bow's "technical report card" - so you'll know exactly how it all turned out. We suggest you keep this report for future reference and for insurance purposes. QC INSPECTION AND PACKAGING: When our setup process is complete, the technician submits the bow package to the QC inspector for check-off. Everything gets double checked, including fastener torques and critical clearances. If the bow clears inspection, it moves on to packing where the settings, specs, and accessory inclusions are checked one final time. Then the finished bow rig, arrows, and all loose components are loaded into a bow case to ensure safe transport to your door. GRATIFICATION? YES. INSTANT? NO: We've been using this process for over a decade. It works, but it takes a little time. And if there is any single issue which persistently gets us into hot water with our customers, it's time. People hate to wait. It's an instant gratification market out there - we understand. Customers want it yesterday. Nevertheless, we're going to keep putting good workmanship first - because that's the founding principle of our store. We enjoy an exceptionally low return rate (under 1%) and an excellent reputation for customer satisfaction (plus an A+ rating at the Better Business Bureau). Again, we are committed to preparing and shipping your order to you as quickly as possible, but we're not trying to be the fastest. We just want to be the best. We respectfully ask for your patience and we hope you will allow us the time we need to prepare your equipment right the first time. In the long-run, we think you'll agree. It's the wisest choice for everyone.